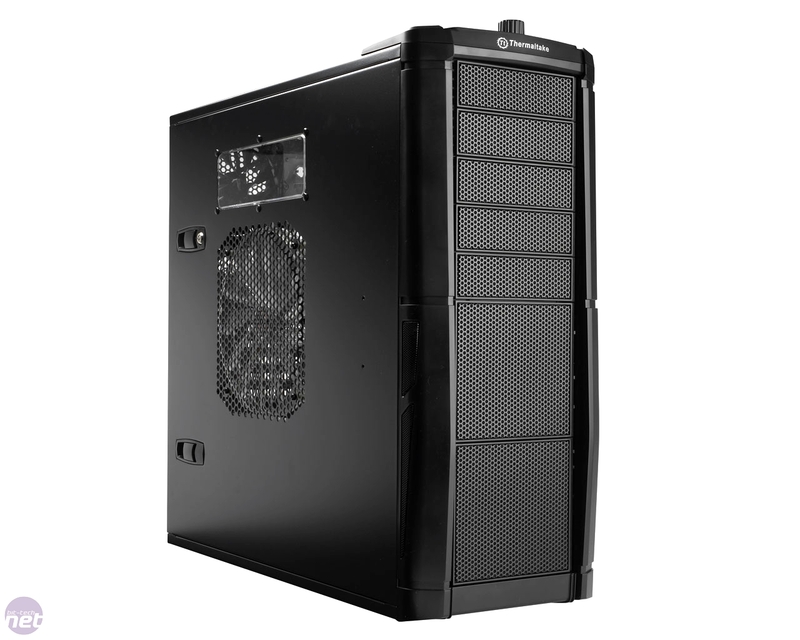 Thermaltake has had a mixed history when it comes to cases, swaying from the odd successes like the Armour+, to plastic ridden failures like the comically named Spedo, without ever really convincingly hitting that combination of solid build quality, cooling ability and features that we enthusiasts demand. 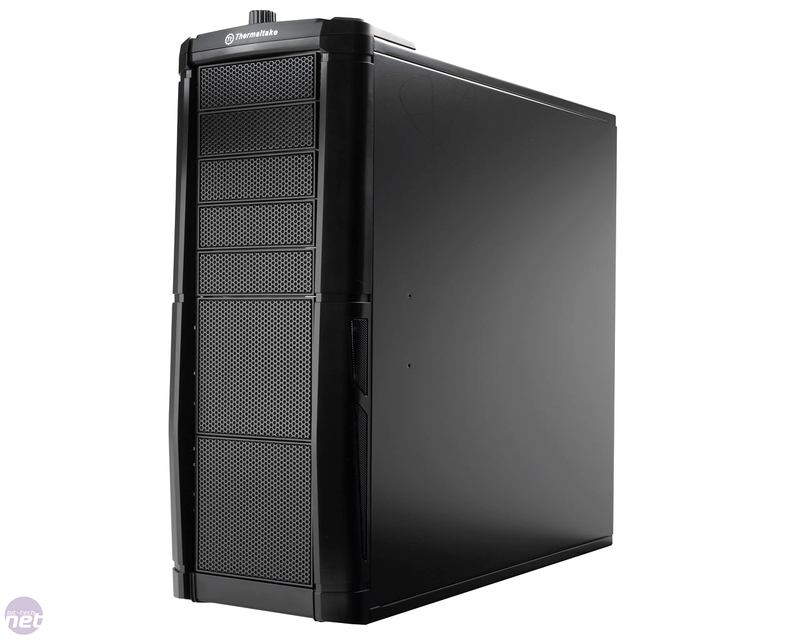 The Taiwanese manufacturer is trying to set this trend right with the latest addition to its Element Series; the £145 Element V. Sporting features like support for E-ATX hardware, multi-colour LED lit cooling fans, adjustable cooling and lighting and a modular drive bay system. 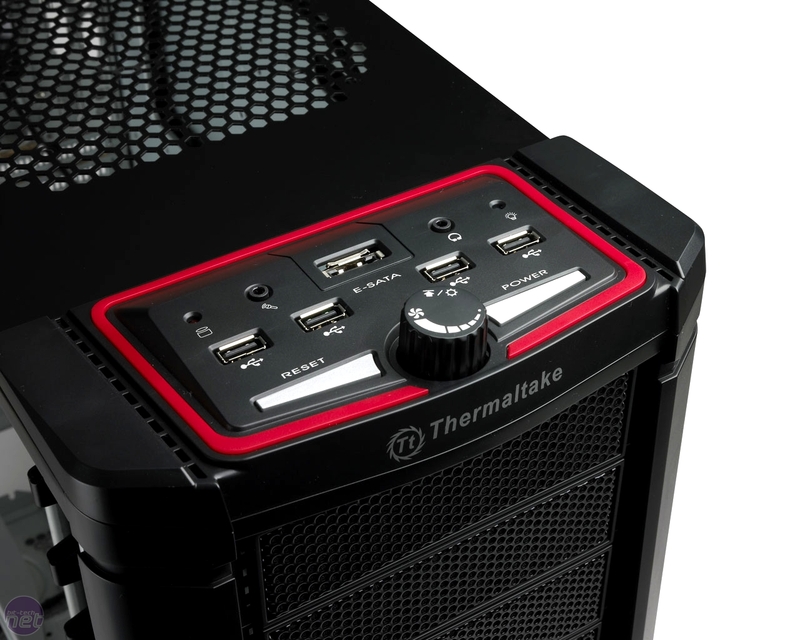 With a great deal on paper that looks good, we found out if the Element V demonstrates Thermaltake as a genuine contender to big hitters like Antec, Lian Li and Coolermaster. The Element V represents a real back to basics change in design from Thermaltake, with the gratuitous plastic styling and moulding of previous examples like the Spedo, have been binned in favour of a much leaner painted steel case with a plain black plastic fascia. It’s certainly a lot easier on the eye than some of Thermaltake’s past offerings, although it’s perhaps a little too non-descript to some, and can from some angles look like a plain black box. 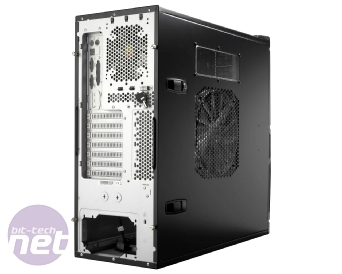 A closer look though reveals the twin 200mm grilled fan mounts in the roof, a small Perspex side panel window and a huge 230mm side panel mounted fan, leaving you with little doubt that this is still a high airflow gaming case even if it is dressed for business. The move to an almost all SECC steel chassis has meant that, pleasingly, the build quality of the Element V is very solid indeed. All the panelling is hard wearing and very difficult to distort, especially the side panels that are particularly stout and well reinforced with their turned in edges. It’s just as well the case is solid though as it’s also seriously capacious; this is very much a full tower case measuring 532mm (H) x 220mm (W) x 537mm (L) and with space for up to eleven 5.25” drives, putting it comfortably into the super-size chassis segment. 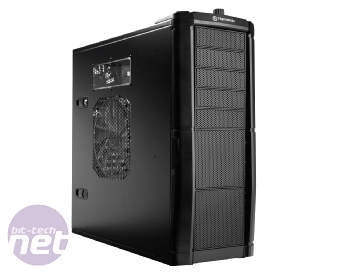 As well as being extremely well endowed (easy ladies) the Element V also boasts some nifty features too, most obvious is its Cooler Master Sniper-esque front panel with integrated fan speed and lighting controls. The dial, mounted in the middle of the front panel between the power and reset buttons, can be used to alternate both the single 200m roof fan and one of the two 120mm front intake fans between blue, red, green, off or a garish light show combining all three colours in a pattern that would make a wedding DJ’s effects look tasteful. While this is a great feature for gamers who want a bit of identity (or in the case of the hideous lightshow, to burn their opponents retinas) the function frustratingly resets whenever the system is turned off, sending you diving for the dial post start-up to appropriately re-colour your system – hardly convenient. The fan control function isn’t ideal either, with the dial only controlling the fan speed of the roof mounted 200mm fan, the side panel mounted 240mm fan and the LED lit 120mm front intake fan, leaving two other 120mm fans (one rear exhaust and one front mounted intake) running unchanged. However, by plugging the two left into a motherboard to use BIOS control, remember the system as a whole can still cover everything. The major issue is that the dial also only allows you to drop fan speeds by 25 per cent, which has little effect on noise or cooling. Rounding out the front panel is the usual array of connectivity with four USB 2.0 ports, eSATA 3.5mm headphone and microphone jacks, as well as power and HDD activity LEDs, all of which are mounted into a plastic hump mounted atop the otherwise steel chassis.